It was Zidane's debut as Real Madrid's first team manager and the Frenchman didn't disappoint the Madridistas at the Bernabéu, as the hosts ran over Deportivo with a clear 5-0 win. Ronaldo didn't score tonight, but Benzema with a brance and Bale with a hat-trick secured the 3 points for Madrid. 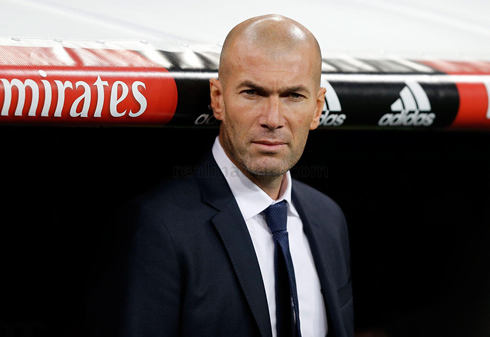 Zinedine Zidane's much-anticipated debut as Real Madrid's head coach was a resounding success, as Real Madrid romped to a 5-0 victory over Deportivo at the Santiago Bernabeu tonight. Gareth Bale continued his impressive run of form with a hat-trick and a double by Karim Benzema was all Madrid needed to record perhaps the most impressive 90 minutes of the season so far by Los Blancos. With Isco and Carvajal back in the lineup, Real Madrid had a different look than they have had under Rafa Benitez. 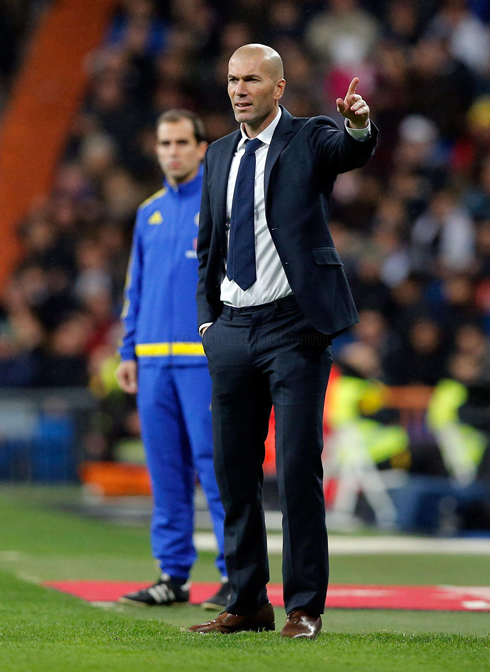 Both players, Isco due to tactical decisions and Carvajal due to his injuries, have seen limited playing time this season, but with Zizou at the helm, they were both given a chance to start today. It only took 15 minutes for Madrid to make their mark and it came in the form of a somewhat controversial strike by Karim Benzema. A Sergio Ramos volley fell at the feet of the Frenchman, who redirected it into the goal with the back of his heel. There were sounds of offside (many believed that Bale had in fact obscured the keeper's vision), but the goal stood. There was no mistake seven minutes later however, as a Dani Carvajal cross met the head of Bale in the box. The Welshman's well-placed header put Madrid up 2-0. Bale's second would come early in the second half, after an accurate pass from Ronaldo and his hat-trick would come in the 63rd minute, on another header this time from a Toni Kroos corner. Karim Benzema would round out the scoring at 5-0 in the last minute and this last goal would be come off a Cristiano Ronaldo failed ball-control inside the box. 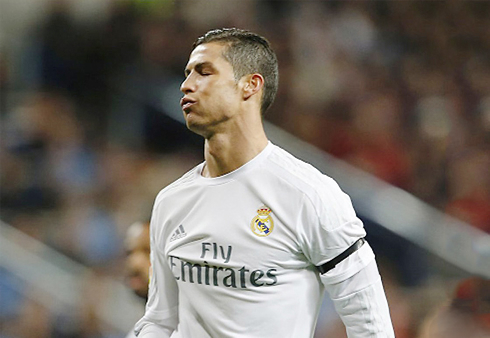 The ball ricocheted off his heel and found an onrushing Benzema, who then smashed the ball in off the crossbar. 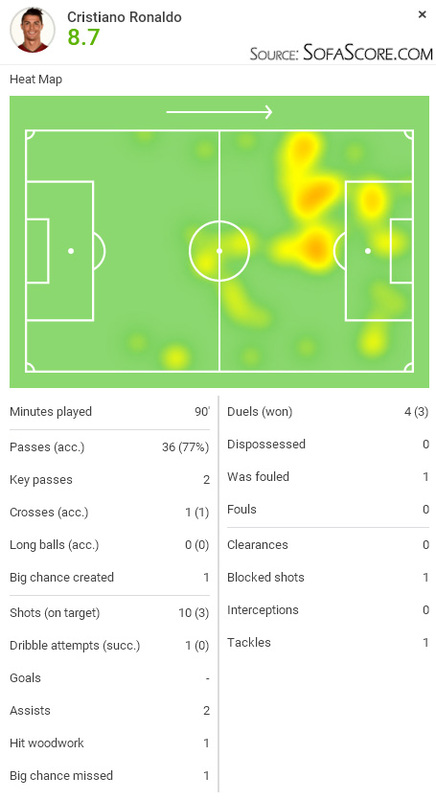 Speaking of Ronaldo, the Portuguese star was very involved all night long, but struggled to hit the target today. We've seen many more game like this recently as he's getting older. Visibly frustrated, he just couldn't seem to find the back of the net. Cristiano Ronaldo next game will be for Real Madrid in La Liga on the 17th of January of 2016, against Sporting Gijón. You can watch Juventus live stream, Real Madrid vs Sporting Gijón, Celta Vigo vs Atletico Madrid, Chelsea vs Scunthorpe United, Tottenham vs Leicester City, and Oxford United vs Swansea City, all matches provided from our live football and soccer game pages.